Speculation about the future of Australia’s housing market is gathering a head steam. Financial analysts and commentators are arguing about whether it is going to go down with a whimper or crash. The truth of the matter is that the outcome is not entirely predictable. This does not mean there are no grounds for serious concern. A host of indicators point to a real possibility of serious trouble. Some of the commentaries ignore this, because there are vested interests, preferring to talk things up, rather than deal with reality, as a means of continuing business as usual. Stuff like this must be put aside. Evidence must be looked at. Some key indicators are not painting a rosy picture. The main one is the level of debt. Private household debt now sits at one-and a half times household income. This means that income is insufficient to pay off the debt plus interest. It does not take a genius to work out that this can’t continue indefinitely. This level of debt is creating instability in the financial system. The extent to which this instability grows in the coming period is going to be a big factor in what happens. We do know that as it is, the risk is considerable. An excessive dependence on debt is evidence that some thing is going wrong, and that it is systemic. Alternatives are insufficient to bring the returns the major investors demand. Tied to the explosion of debt, has been the explosion in property prices. Driving this are few factors. The scale of corporate buy ups created an artificial shortage for a time. Making it worse, have been the generous negative gearing provisions. Holders of large portfolios of property get a big government refund for rent foregone. This means that keeping properties unoccupied both attracts the government money and cuts the cost of maintenance and agent fees. Most importantly, this has been used to create a price bubble, so that the holders of the portfolios can make a gain out of speculating on prices. Emerging now, is a trend for the corporate property portfolio holder to reduce their stock. Should this speed up into a run, prices will come crushing down. Whatever is going to happen depend is going to depend on the health of the financial market, the strength of alternative avenues for investment and how the government handles the situation. A big factor in the financial market, is the demand for the Australian dollar. In the recent past, a high demand from US based investors had kept its exchange rate at a high level. This was because the weak American dollar, and the fact that the Australian financial market is one of the most deregulated in the world. These investors exchanged American dollars for Australian ones, by buying up bonds. Lately, they have been selling these off, in order to make a gain from the higher valued Australian dollar and the expectation of a further gain, as the value of that currency rises to a higher level. This could burst the property bubble. Should the Australian government choose to do nothing to mitigate the risk, the chances of something going wrong will increase accordingly. Alternatively, if it should decide to introduce enough regulation into the financial system and have an influence where investments go, may be able to smooth the downfall. So far, there is no sign that this is going to be done. 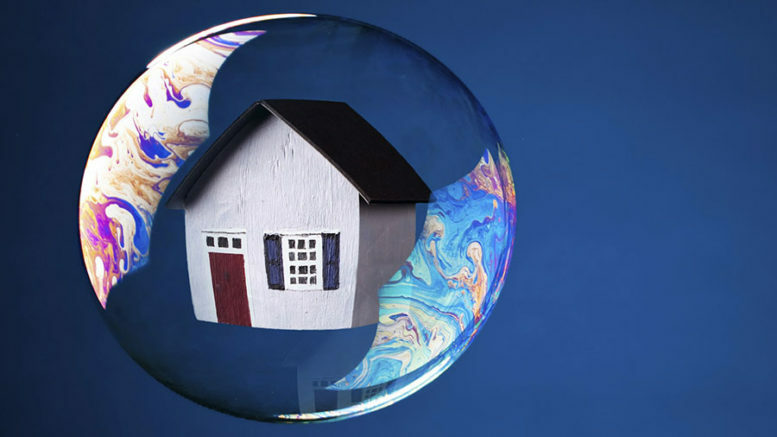 Crucial to managing the coming down of the property bubble, is to dismantle the negative gearing provisions in a step by step way. Doing it all at once would cause a crash. By doing it incrementally, it can be managed. Emphasis should be on the corporate property folio holders. Mum and dad buyers should be left exempt. This could be means tested and based on the number of properties owned. The government should also invest a great deal more on public and other forms of social housing, which will also help check property prices and rents. Money that otherwise would have been paid out on negative gearing could be used for this purpose. The biggest challenge is overcoming the debt crisis. This also requires government intervention. Success means that certain conditions must be met. Disposable income for the population must rise. Wages must go up and government services increase. The financial system must be cure from its excessive dependency on debt, through measures that impose greater control over how funds available for investment are used, to ensure that the economy shifts from excessive dependency on price fluctuations, and towards well anchored and sustainable economy that depends on creating the goods and services that we really need. Setting the economy on a more solid foundation and providing the means to overcome the debt problem is the way to guarantee a softer landing, and lead to success in providing the type of housing that Australia needs. .
Be the first to comment on "Is there going to be a housing crash or not"